UPDATED July 1, 2016 – added 3 new photos and tip about removing stubborn egg shell pieces. I’ve sorta neglected this blog (okay, I truly did :p). Anywho, I think it’s time to set this blog right again by posting a few recipes back-to-back. 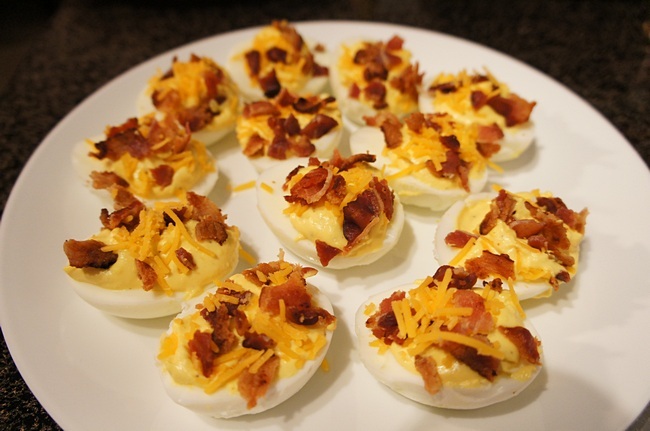 I’ll start with these Deviled Eggs my sweetie, Chip, and I made on Easter. Chip’s mom gave me the recipe while we were visiting this past Christmas. I asked her to estimate it for 6 eggs (she made way more than that since there were 15 of us celebrating). This was my attempt…and thankfully, it was a success! With these two toppings, it can set in motion to bring world peace! 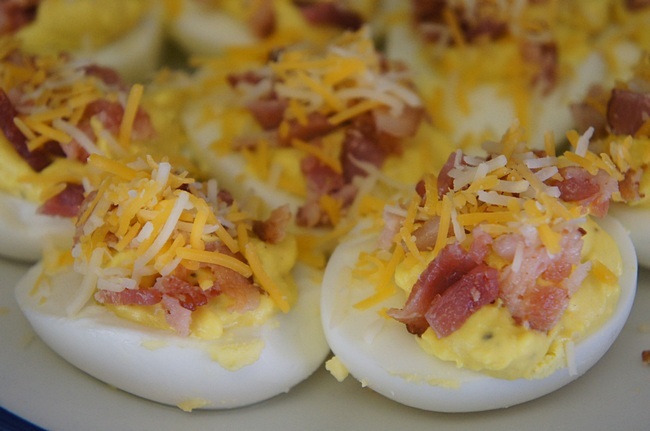 Yes, these eggs are that good! I swear these eggs were like crack. LOL. Half of it was gone in a matter of minutes. It took us 2 days to gobble up the rest. Inside pot, place eggs in single layer. 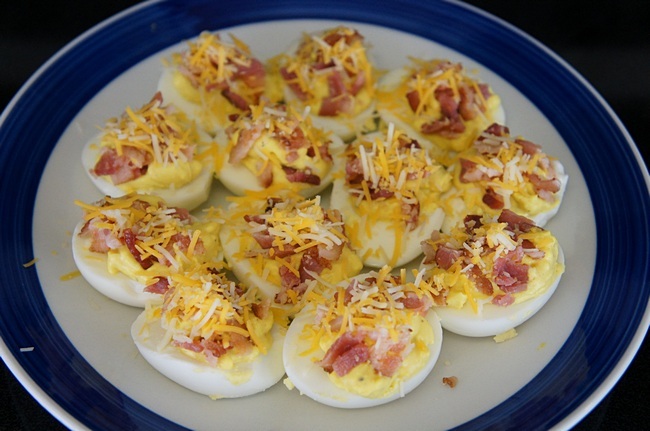 Use cold water to cover an inch over the eggs, then cook on medium-high heat until it comes to a rolling boil (i.e. vigorously boiling). Turn off stove, then cover pot and let stand for 13 minutes. Place each egg inside a cold water bath (throw in some ice cubes if the water’s not cold enough) and let eggs sit for 5 minutes. Remove eggs from water bath. One egg at a time, lightly tap each end (ideally on a wooden cutting board), then roll. Peel shell. Something I learned from making these about half a dozen times now… if there are stubborn egg shell pieces/fragments, dip egg in bowl of water and gently remove. Blot wet eggs on paper towel. Cut each egg in half, lengthwise. Gently remove the yolks and place in bowl. 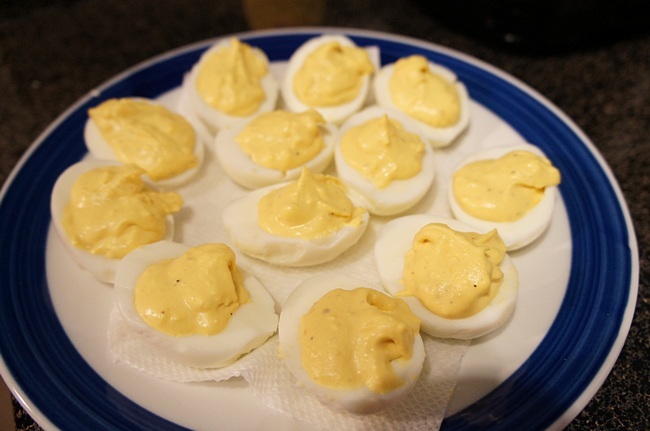 Mash yolks, before adding mayonnaise, mustard, salt, and pepper. Stir until smooth. Spoon yolk mixture back onto egg. 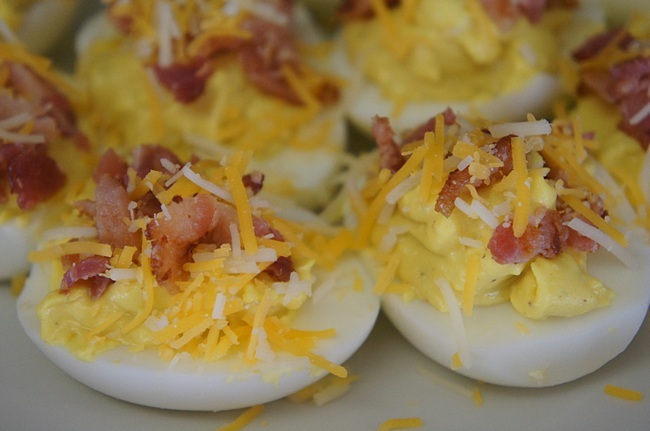 Top with chopped bacon, and shredded cheese, or whatever tickles your fancy.